During the weekend of 01/08/16 thru 01/10/16, northbound Avenue E, between 52nd Street and the Toll Plaza, will be reduced to a single lane of traffic, 8:00PM Friday to 10:00PM Sunday, for paving operations. Work will be supported by Bayonne Police. Water main work will resume the week of 01/04/16 on Avenue E at E50th Street and E52nd Street will continue. Daily traffic detours will be utilized, 8:00AM to 3:30PM, to facilitate this work. This work will be supported by Bayonne Police. Bridge pier construction will begin in dedicated work zones. Periodic closures of E52nd Street will be utilized. This work will be supported by Bayonne Police. During the weekends of 01/08/16 thru 01/10/16 and 01/15/16 thru 01/17/16, northbound Avenue E, between 52nd Street and the Toll Plaza, will be reduced to a single lane of traffic, 8:00PM Friday to 10:00PM Sunday, for paving operations. Work will be supported by Bayonne Police. 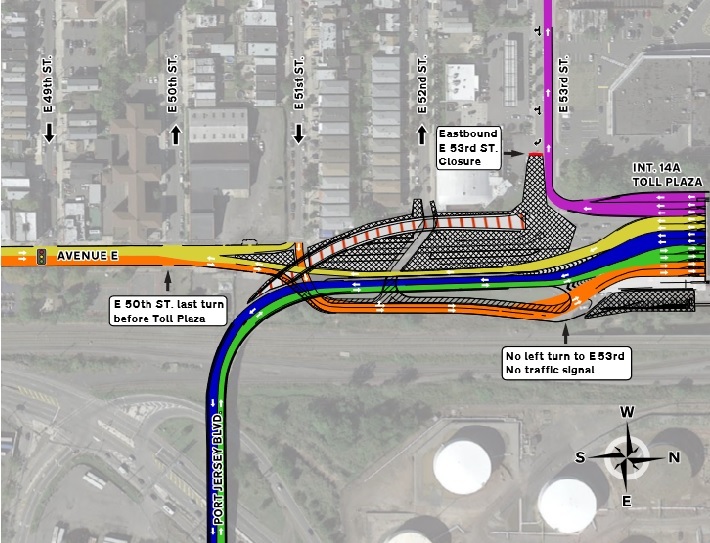 On Monday, 12/28/15, JFK Boulevard will be reduced to a single lane of traffic in both the northbound and southbound directions during the day for concrete deck placement. This work will be supported by Bayonne Police. Access to Frontage Road from southbound JFK Boulevard will be detoured. On Tuesday, 12/22/15, JFK Boulevard will be reduced to a single lane of traffic in both the northbound and southbound directions during the day for concrete deck placement. This work will be supported by Bayonne Police. Access to Frontage Road from southbound JFK Boulevard will be detoured. This same traffic impact is anticipated for 12/28/15 and 12/31/15. Deep sewer relocation work will begin. This Thursday evening, December 10th, Garfield Avenue will be closed between 55th Street in Bayonne and Merritt Street in Jersey City between the hours of 8:00PM to 5:00AM for bridge beam erection. Traffic will be diverted to Avenue C. This work will be supported by Jersey City and Bayonne Police. During the evening of 12/10/15, Garfield Avenue will be closed between W55th Street and Merritt Street, 8:00PM to 5:00AM, for bridge beam erection. Traffic will be diverted to Avenue C. This work will be supported by Jersey City and Bayonne Police. This work will also be supported by Jersey City and Bayonne Police as needed.